Super cute, love the ladybug set. I'm sure the recipient will treasure it too! So cute! I love the google eyes! What an adorable gift set this is, Sherrie!! I love the ladybugs!! The texture you added to the flowers is awesome!! So fun and fabulous my friend!! They will be adored!! Oh my sweetness! I love ladybugs and this one is super cute on that big, bold daisy. Love the great texture and those wiggly eyes. The polka dot print sets off your cute embellishments perfectly, I just love this set! 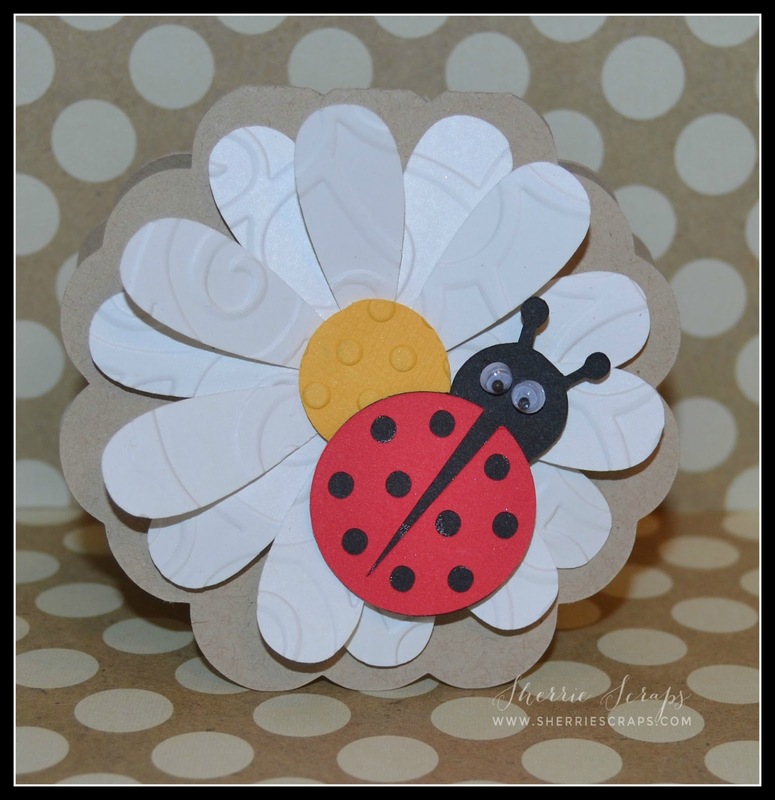 Adorable project, those little ladybugs are so cute! The polka dotted theme is one of my favorites and I love the embossing! These are both super cute!! Love them both!! Have a great day. Wow, this turned out so pretty! 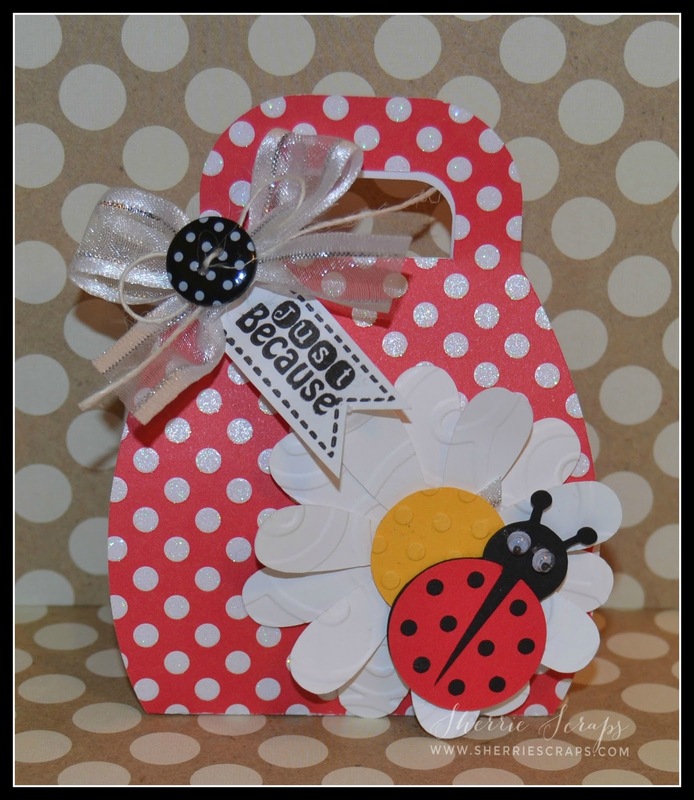 I just love all the dots and those cute little lady bugs! Hope you're getting nice weather - we have June gloom but only until about 3:00 then the sun peeks through for a couple hours - better than nothing :) You take care and I hope to get caught up in the coming weeks, I'm rushing out to soccer practice but wanted to say hi! Sooooooo cute! LOVING the daisies and the lady bugs!!!!!! Precious. 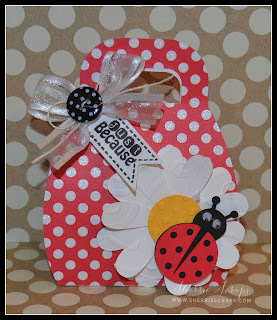 Love the red and white polka dot bag, the flowers is too cute and the ladybug is adorable. Love it. The cutest ladybugs! Such an adorable set love the great flower too! This is such a darling set! !I love the bag and ladybug too! I ADORE the embossed flowers and those super cute googly eyes!! This is just the prettiest lil bag and card! Love the embossing on the flowers! Thank you for joining in on the Summer Challenge at Craftin' Desert Divas!! This is so super ADORABLE Sherrie! LOVE those ladybugs!!!! The busy lives of 2 teenage/preteen boys! These are so adorable ! Talk about super cute my friend ! They are wonderful ! Sherrie this little purse treat box and matching flower card are just adorable! 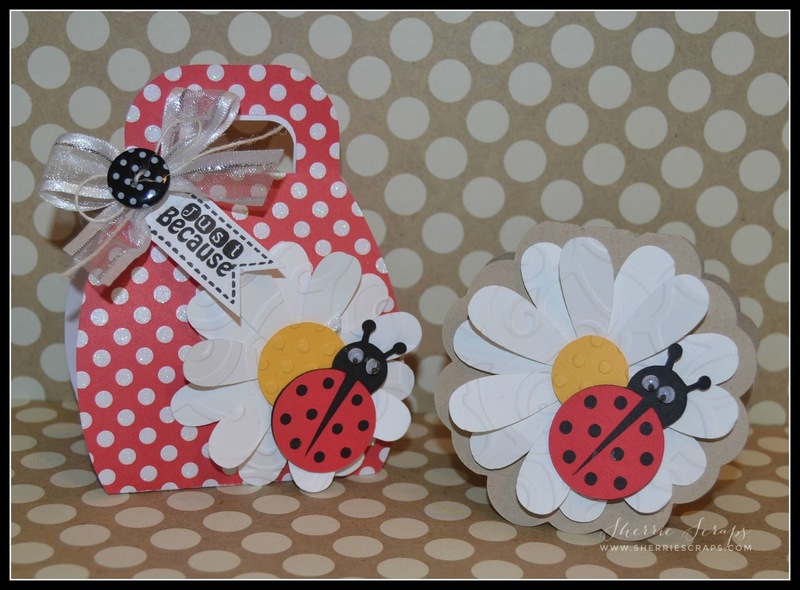 I love the paper you used on the treat box and your ladybugs are so cute!! Thanks for joining us in our Funday Friday challenge this week! This is adorable, Sherrie! The ladybug, the daisy, the polka dots. So cute!! Super cute ensemble! Love the googly eyes!